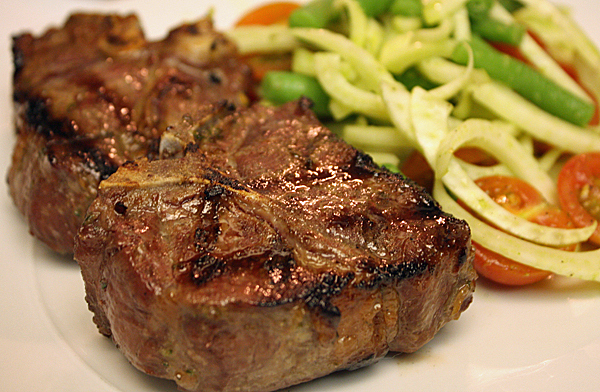 Week 22, Meal 2: Marinated and grilled lamb chops over green beans, fennel, and tomato fits that bill. The salad is fast and flavorful and the lamb chops, as simple as the marinade ingredients are, bursts with a sweet and salty succulence unlike any lamb we’ve cooked so far on the blog. 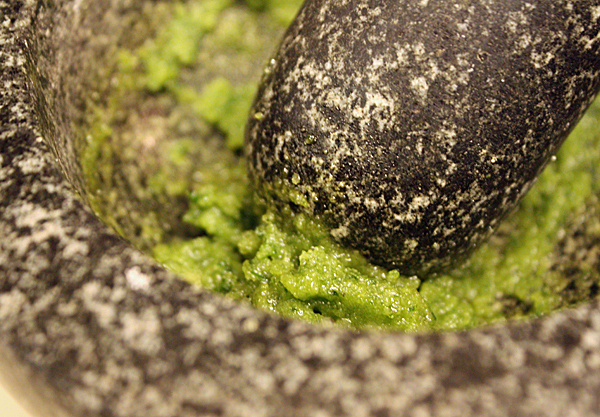 In a Magic Bullet or with a mortar and pestle, mix 1 1/2 T of sugar, 1 T of salt and 2 T of chopped basil into a paste. 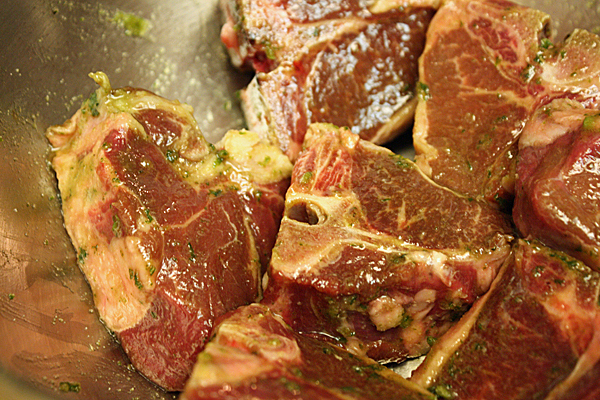 Brush each side of 6 single-boned lamb chops with the mixture and let sit for 30-45 minutes. While the meat is taking its flavor bath, knock out the salad. Knife time: Clean 4 oz. 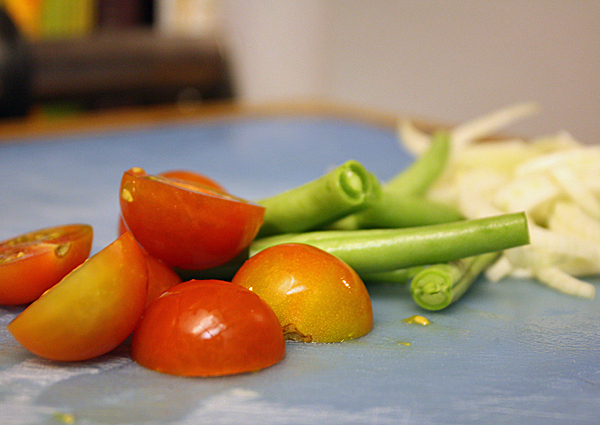 of green beans and cut into 1-inch pieces; slice 1 bulb of fennel thin; and halve 12 cherry tomatoes. Juice 1 lemon while you’re at the prep table. 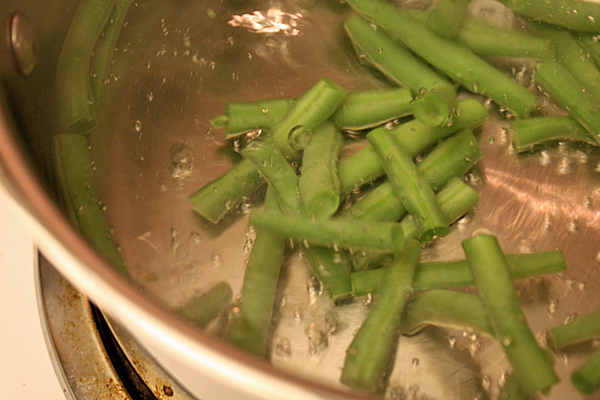 In a pot of salted boiling water, blanch the green beans for 2-3 minutes. Drop in an ice bath or rinse with cold water to stop the cooking process after. After the green beans, drop the remainder of your basil leaves into the water and blanch for 30 seconds (make sure to do green beans, then basil — not the other way around). 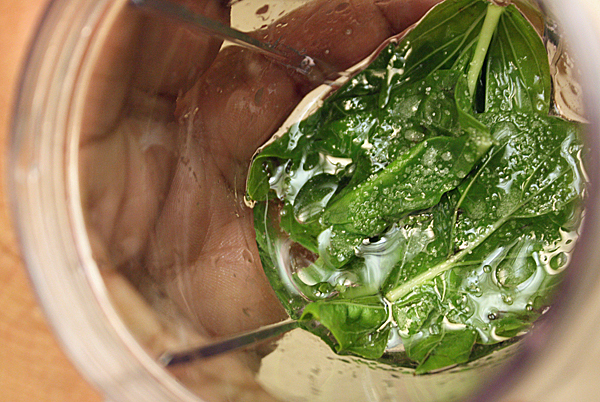 Next, blend the blanched basil with 1 T of vegetable or grapeseed oil, 1 T of water and a pinch of salt. 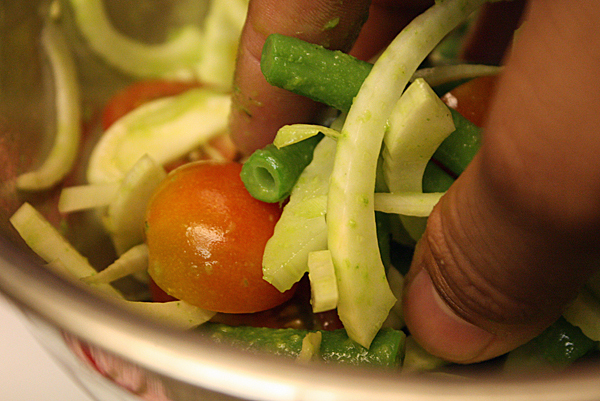 Mix until the puree is bright green. Cool in the freezer for a couple of minutes to preserve the bright green color. Now would be time to preheat the grill to high. Spray grill with cooking spray and grill the chops. If they’re the lollipop cut (round of meat, bone on the end) grill about 2 minutes per side. I used a different cut of chop, similar to a pork chop, and grilled mine about four minutes per side. When done cooking, let rest while you put together the salad. Mix the veggies with just enough basil puree to coat the veggies. Drop in the lemon juice. Season salad with salt and pepper. To plate: Put 1/2 of the green bean salad on the plate. 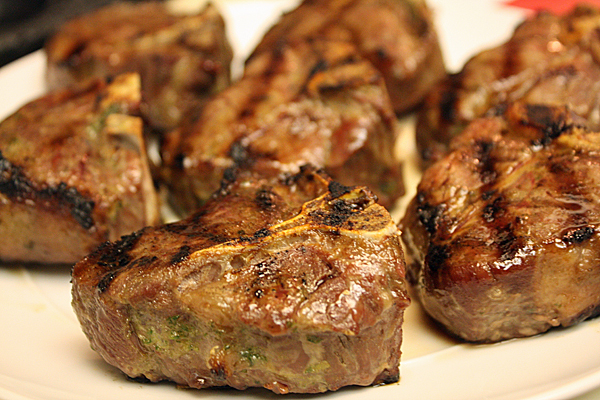 Top with 3 grilled lamb chops and drizzle any extra puree around the plate. Wifey Nadia and I really loved the bright basil puree and how it complimented each vegetable separately. The salad is super summery, and because it’s so quick to make, it’s probably going to become a staple for the next few months in my house. The sugar caramelizes on the meat, and the salt brings out all of the savoriness. The chopped basil adds a hint of herb that flavors the meat without overpowering the balance of sweet and salty. Make this one when you are short on time but need to impress with your kitchen prowess.